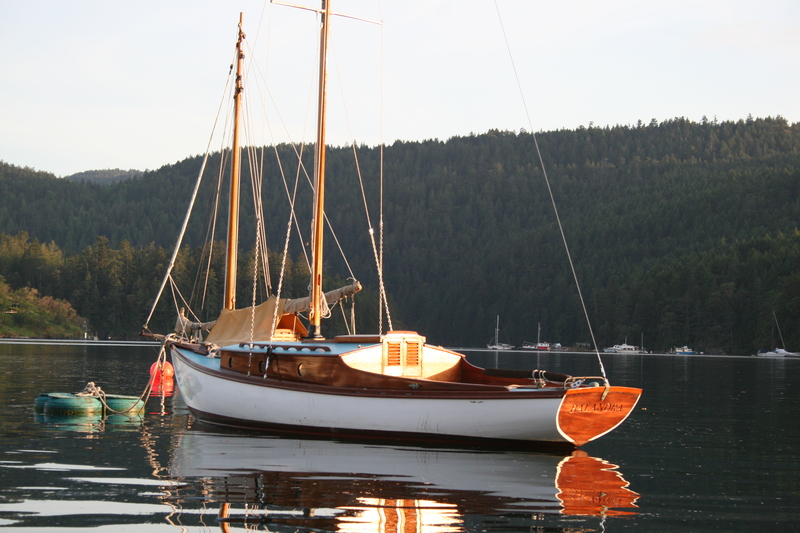 She was restored in 2009, in Brentwood bay. Actually, thats where we met Shendra for the first time!! 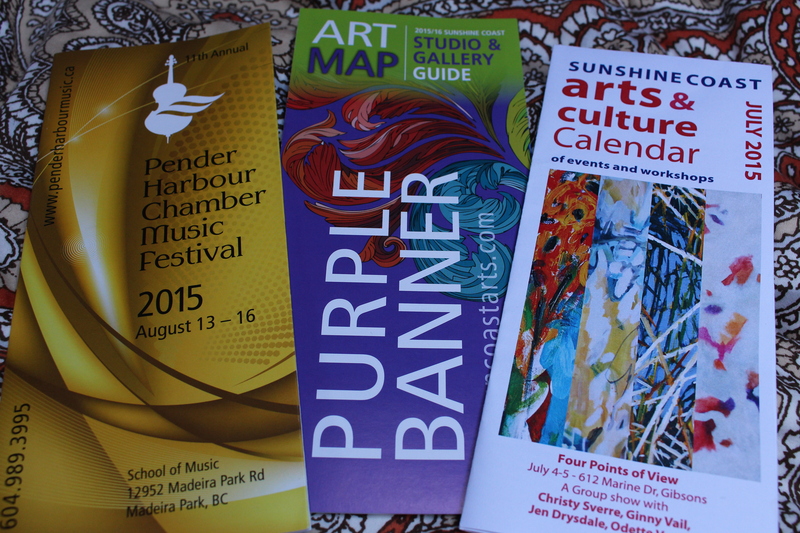 She then told me she lived in Pender Harbour, and we had no idea where that was!! I took photos of Balandra then again, it will give you a better idea how beautiful she is. SV BALANDRA in the setting sun. 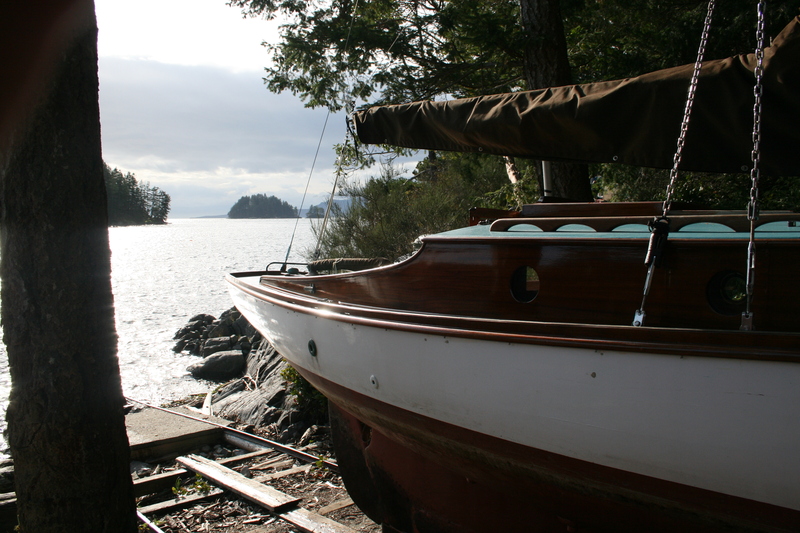 Resting at her buoy in Brentwood bay. 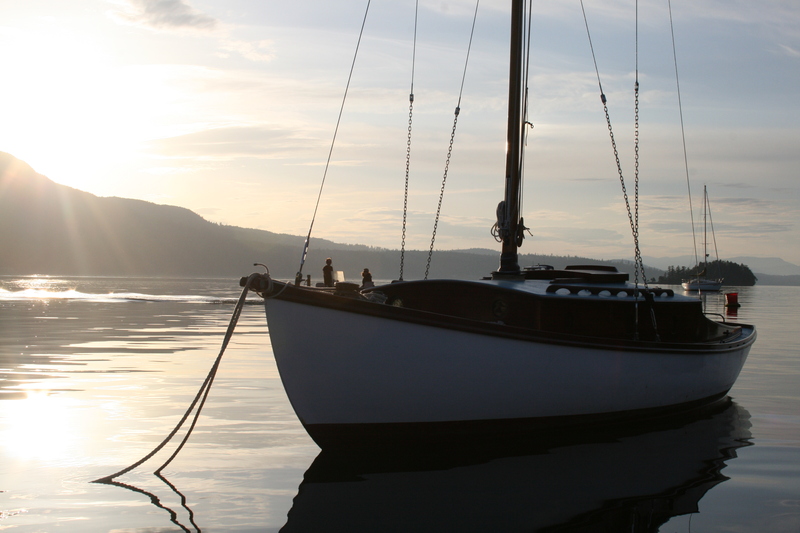 Our very dear friend,Shendra, owns a small sail boat, her name is Balandra and she is out of the water right now, sitting just below Shendra’s house, near the waters edge. 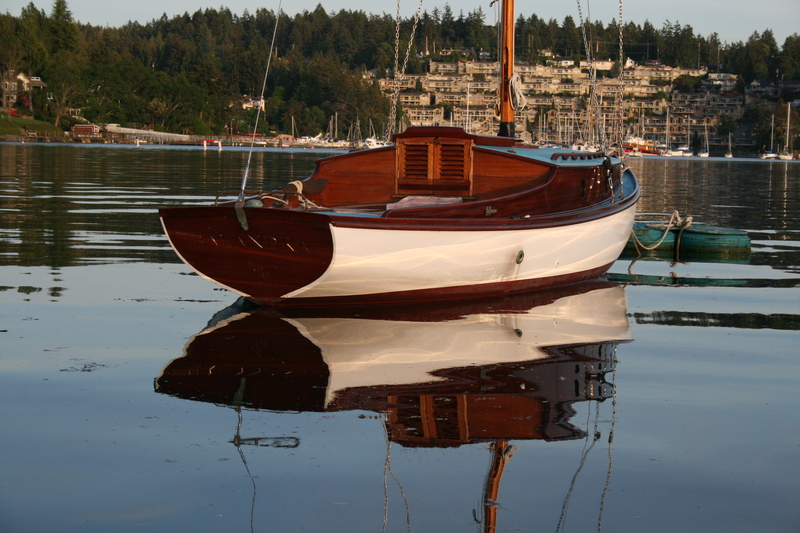 This beautiful boat was built by Shendra’s late husband, Collin Hanney, from 1942 till 1945. 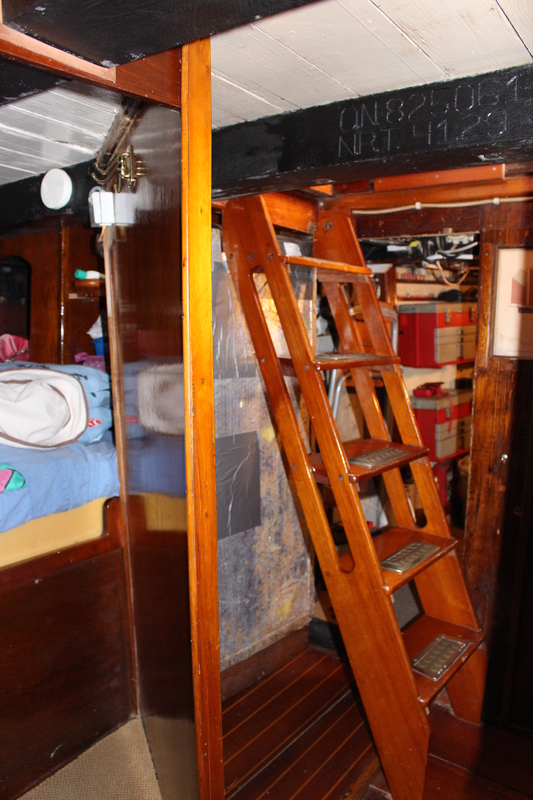 She is a Marconi rigged sloop, her hull was designed by William Hand ,Collin designed her mahogany cabin. her beam is 6’2″,her draft is 4’0″, and she is 22′ long. She is made from red cedar and has a white oak frame. 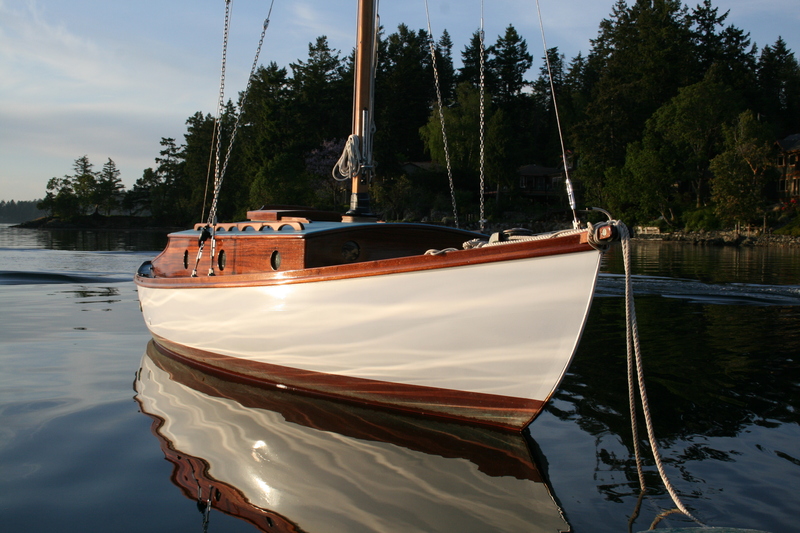 her keel ballast is 1100 lbs.of cast iron. 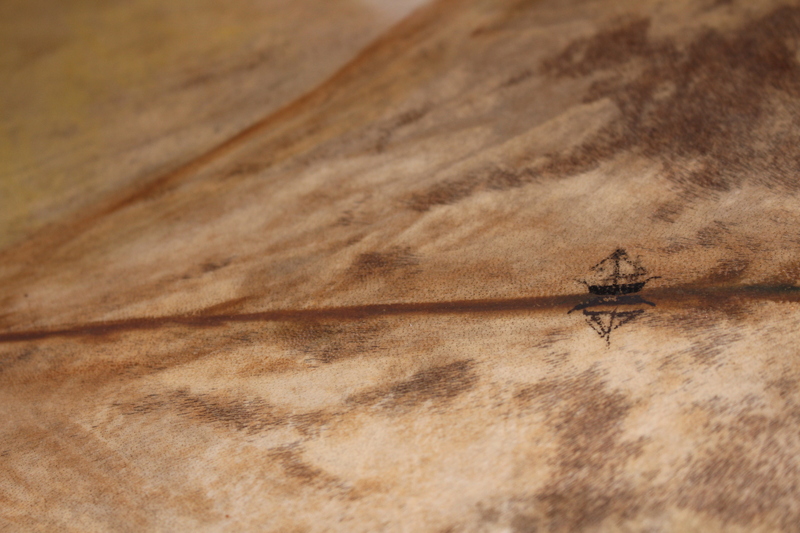 The mast is laminated spruce. She is a beauty, a lovely little boat, Bert has been working on her, as she has a small problem with the sleeve of her rudder, today we brought the rudder away to the welder. 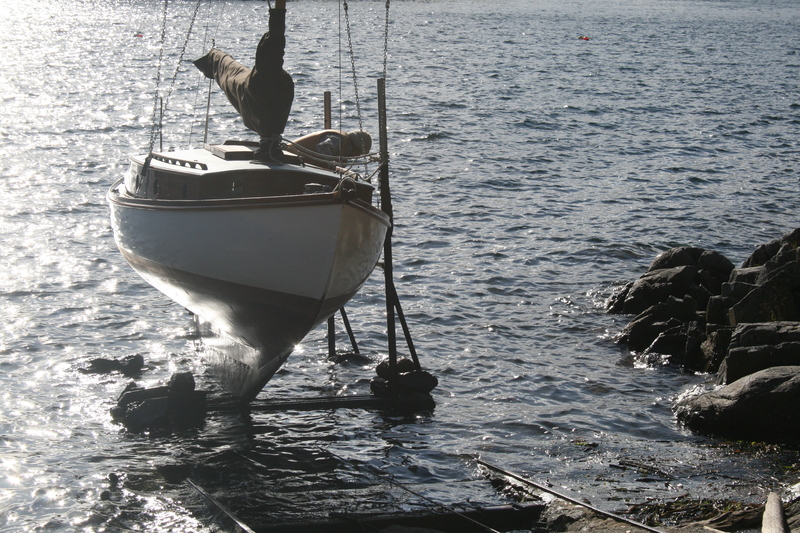 To take the rudder off, everyone thought she would have to be lifted up, somehow….. but Bert had a look, dug a hole, (not easy!!!! big rocks!!! ), and pulled the rudder out from the bottom. Shendra did a dance out of pure joy, this had been so much easier then she had thought it would be!! 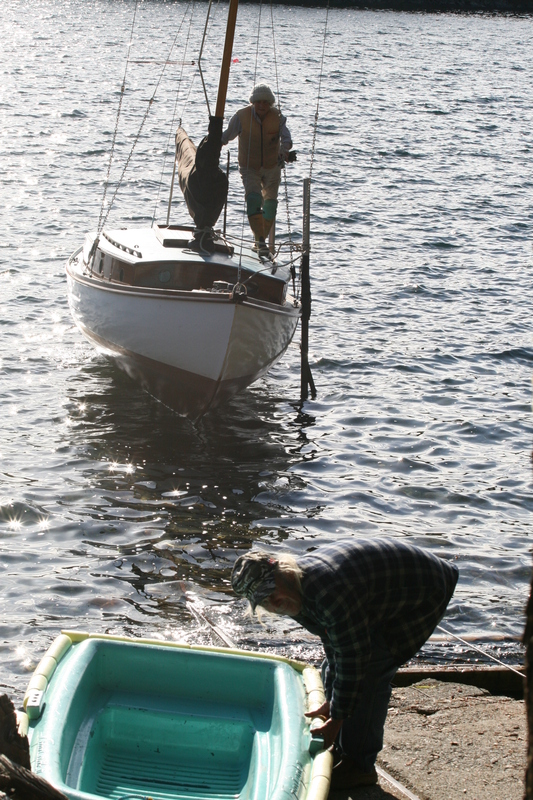 Several years ago we helped take her out of the water, before winter, and i have some photos of that event too. Shendra has rails running from the water up to the shore , on which the boat rides. An electric motor pulls her up. 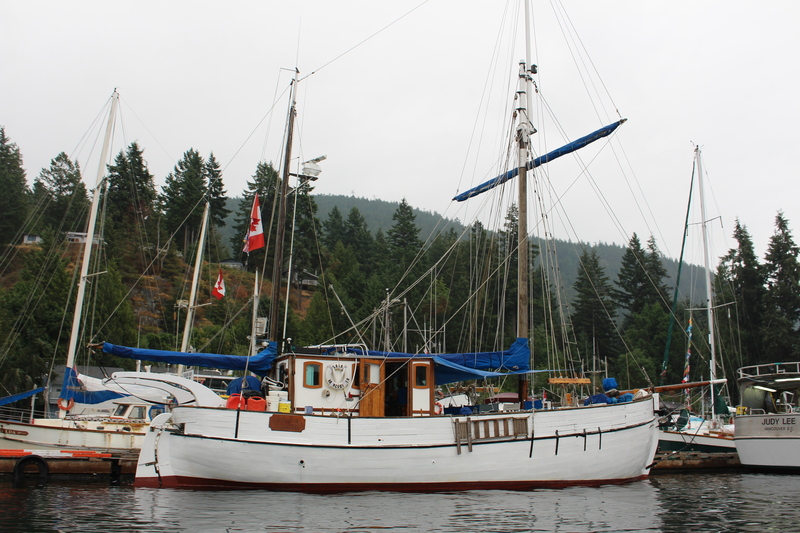 Shendra is on the boat, Keray Farrell helped out ,slowly aligning the boat to the rials. These photos were taken with my old camera, which ended up in the ocean…..
A happy Shendra, its going well!!!!! 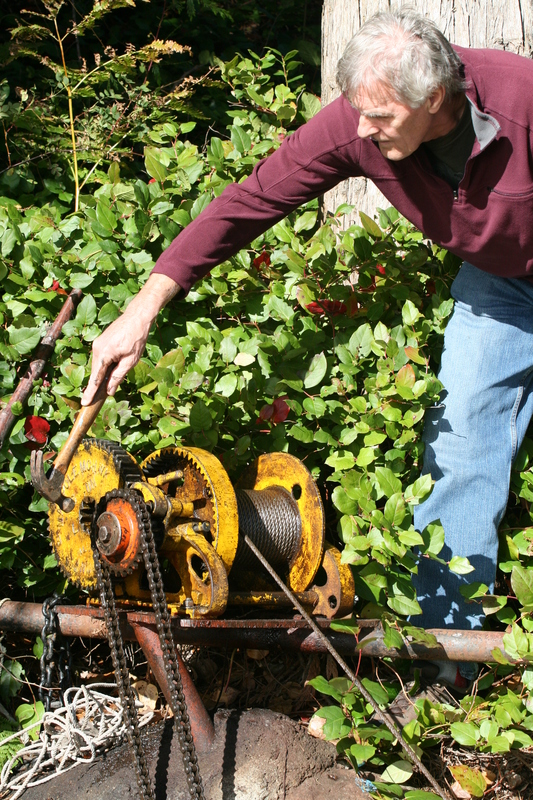 Bert making sure the chain stays on the pulley. Madeira park,a wonderful place to visit. We met up with our friend Judy ,had coffee at the “Copper Sky” coffee shop, and then walked over to the new Bistro after looking around for a while. There are a lot of artists here, and a lot of music!! 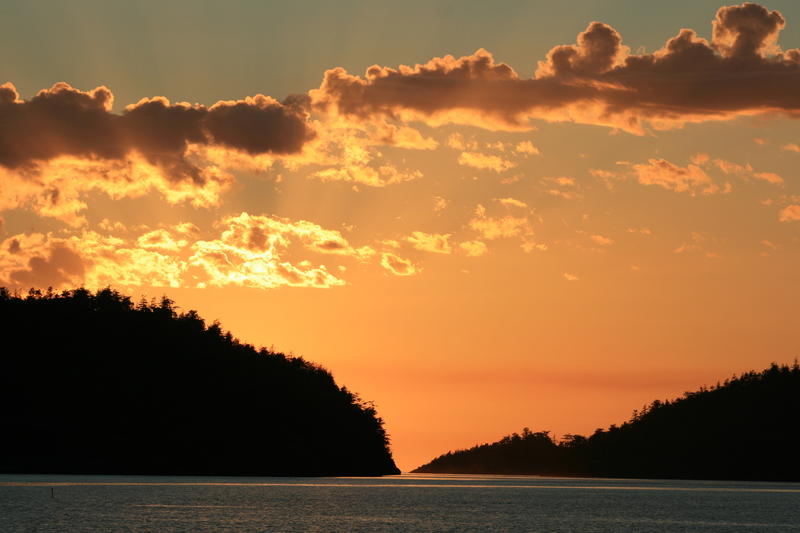 There is something for everyone , but still the place is quiet and peaceful, and has a definite charm! In a way its nice that not too many people have discovered this area yet, but who ever finds it will not be disappointed!!! Lots of information about what to do in this area. 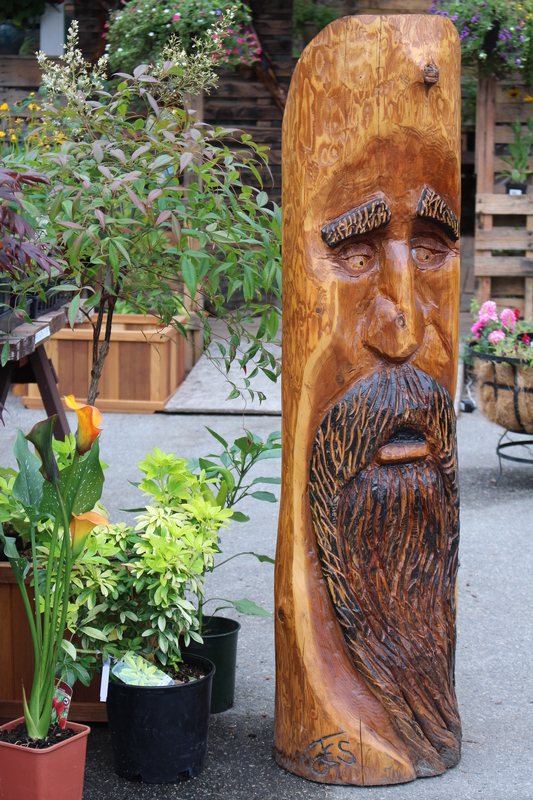 Lots of beautiful plants for sale at the garden center, but also this stern looking fellow! 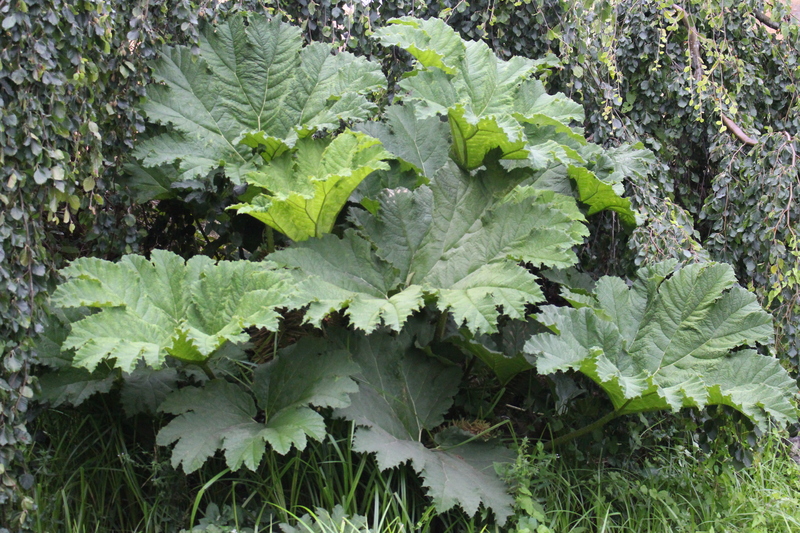 The Gunnera Manicata, a giant of a plant, well worth a second look!! 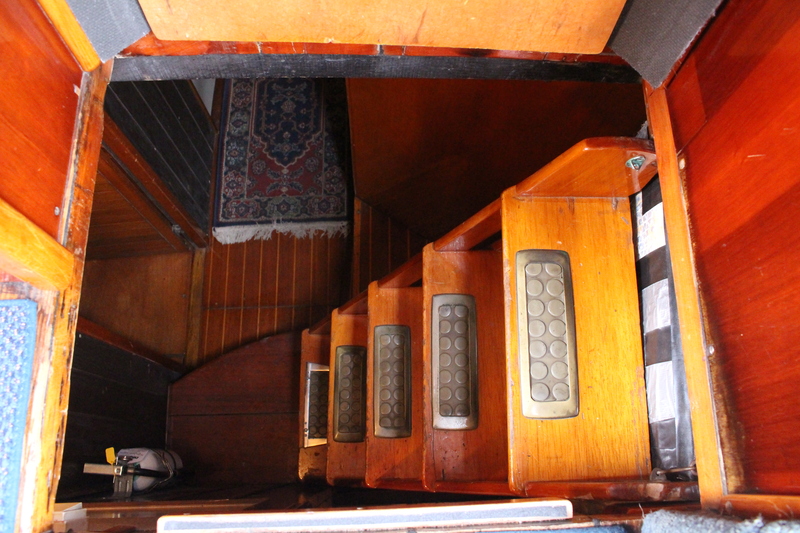 The main hatch, it is definitely quite dark down below, most of the older wooden vessels are. 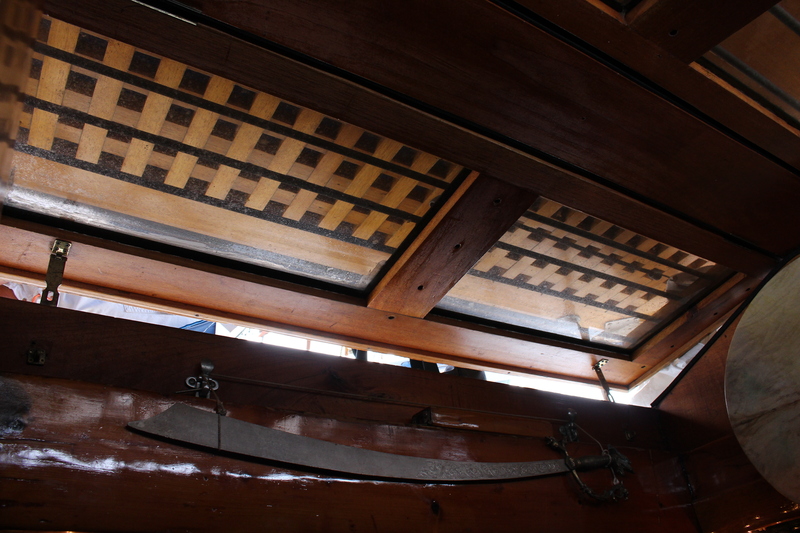 some light comes through this hatch, but it also has a beautiful teak cover overtop. A drum, i believe made for Nancy, look at the tiny sail boat detail. 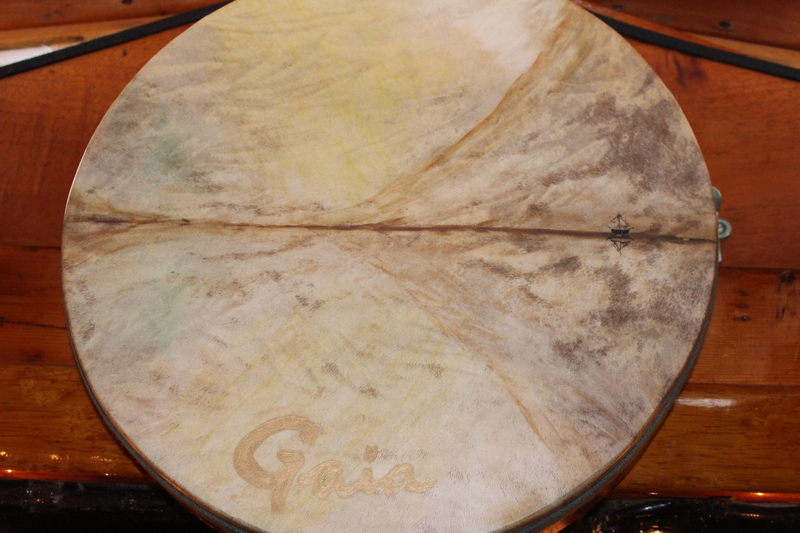 The coloring of the skin on the drum looks like the ocean and sky. SV GAIA at the dock on a very dark and rainy day. 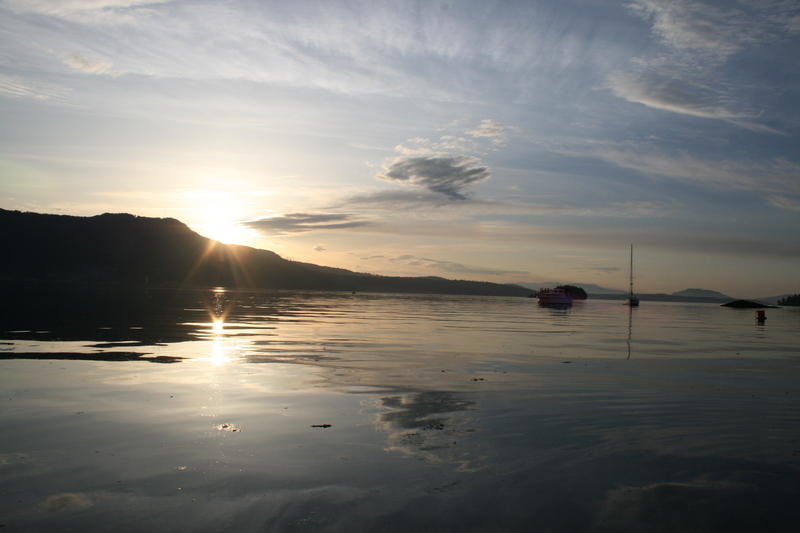 Here we have had all this warm weather, sun every day, and wouldn’t you know it, on Pender Harbour days it rained!!!! It did not stop people from being enthusiastic and being there! 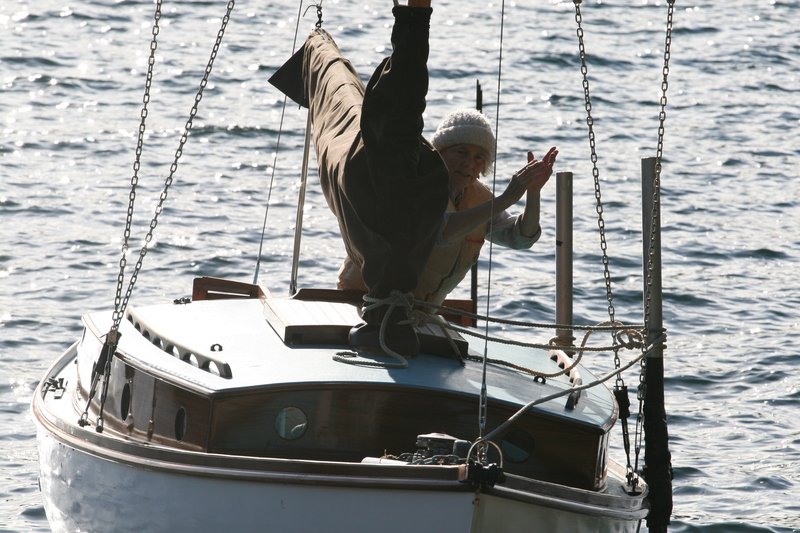 There were displays of wooden boats, beautiful kayaks, row boats, but out in the harbour was a ship that drew us to her, SV GAIA, a gaff rigged ketch,60′ long, 18′ beam, and she draws 8′. 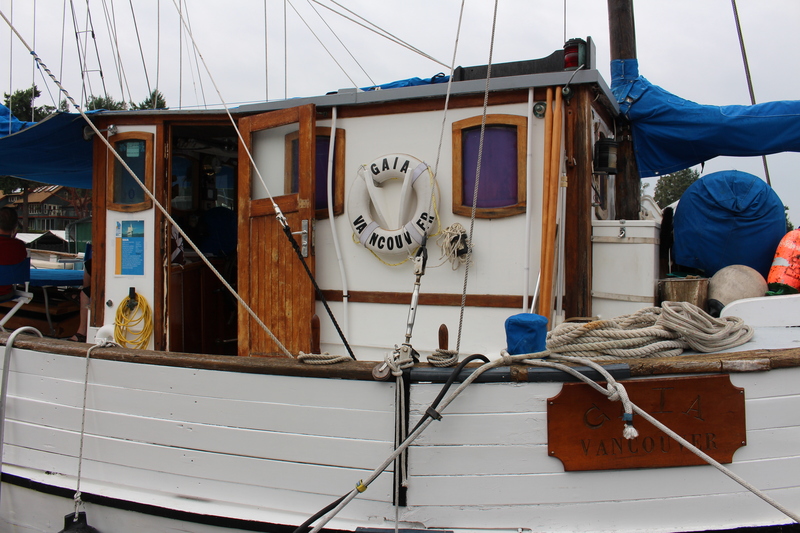 She was built in 1921 in Sweden, and used to be an engine less fishing trawler. her first engine was a 10, yes 10!! 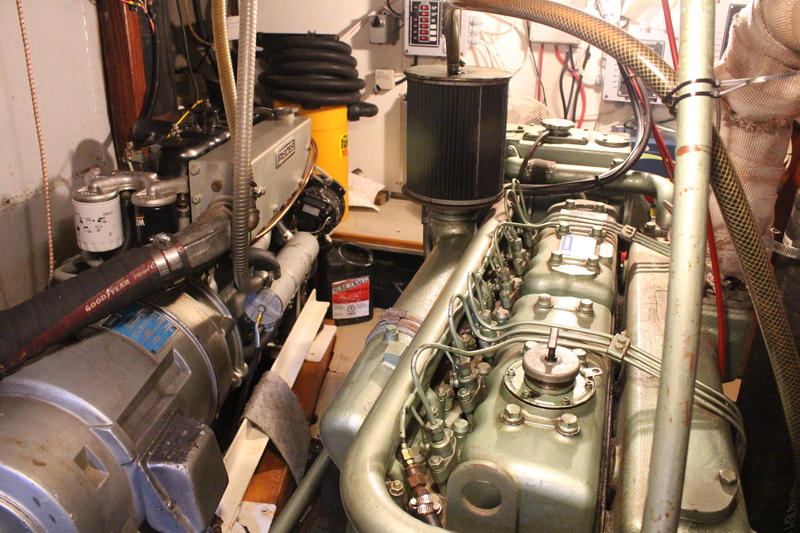 hp diesel installed in 1939. At that time she was a Norwegian registered vessel. 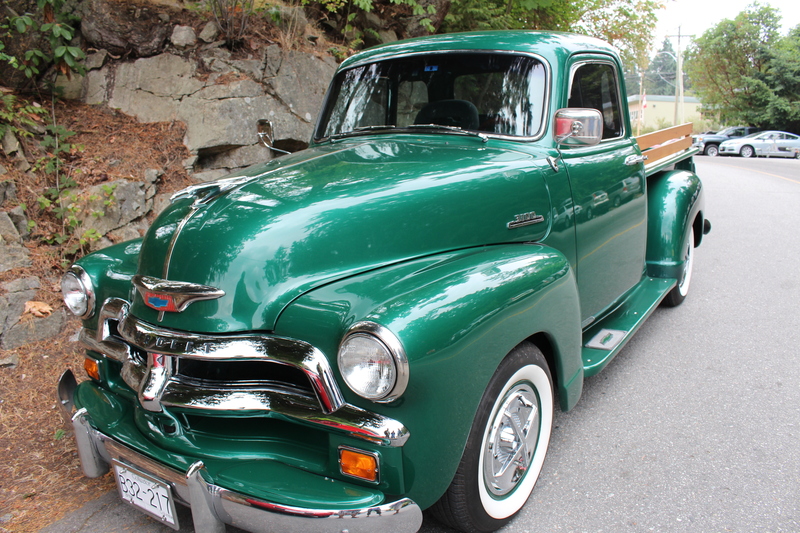 She now belongs to Bob and Nancy Ingersoll. 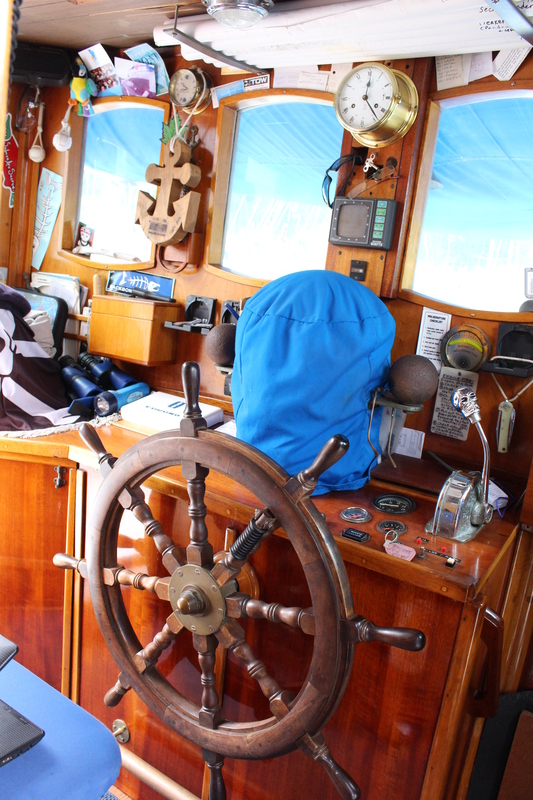 We were so lucky that Bob gave us the full tour of the boat, i love going into older wooden boats, and i was fortunate enough to take some photos. 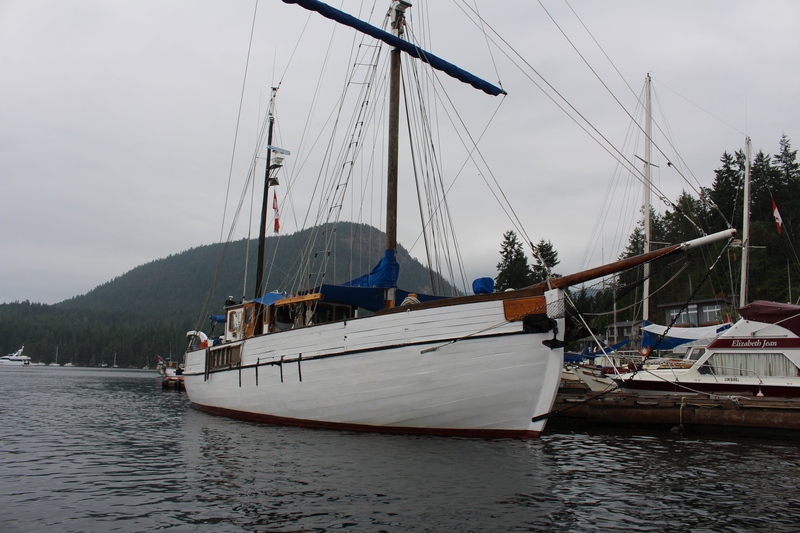 Here she is, moored in Madeira Park,SV GAIA. 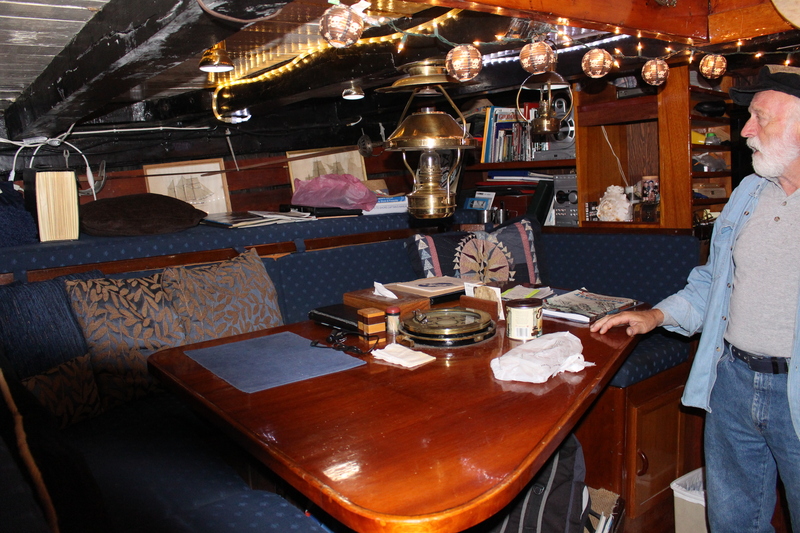 Bob showing us the main salon.